This is one in a series of articles on how individuals have traveled to Paris to live. I first met Paul Helton in our local Kroger store. He was a kind, soft spoken man who helped me with my groceries as we visited about his journey to Paris. Paul has a long history with Kroger but only recently as an employee. He grew up in Iuka, Mississippi, named after the Indian Chief who is buried there under an old bank building. It’s a small town of 2500 inhabitants and had a Kroger storefront on the town square. His parents had always enjoyed the Spotlight coffee sold by Kroger and would even talk about Mr. Kroger as if he were a family member. After college, Paul and his wife, Carol, moved to Pasadena, Texas where they raised their two sons and taught for 30 years. Paul liked teaching history and Carol elementary school. Fortunately for the family tradition, a Kroger store was nearby. They appreciated the familiar store lay-out and its convenience. When retirement loomed, Paul and Carol decided to move to Paris as they had discussed for many years. Carol’s mother was from Pattonville and she still had loads of cousins and their families around. They had visited over the years and found it friendly and easy to be among family. And, there was a Kroger store. Soon after their move to Lamar County in August of 2007, Paul was requesting some of his dental care items from the manager at Kroger who ordered them immediately. The manager even offered him a job in customer service which meant he would assist in restocking goods but primarily have direct contact with customers by bagging groceries and loading them into cars. Paul decided to take the job even though he would easily be the oldest one working that position. He wanted to stay healthy and he missed contact with people. This job would provide more interaction with customers of all ages. Kroger is a unionized company and associates have the opportunity to join. But Paul made sure I knew it wasn’t a radical union. Its agreements treat workers fairly and he is comfortable with paying the dues to the UFCW. The higher pay also helps bring stability to the staffs of Kroger stores. The Kroger store in Paris draws from a large area. Paul has enjoyed visiting with people from Commerce and the university there. Many others come from Oklahoma. Since I always carry my own bags, I asked him how many customers do the same. He estimated 5% bring their bags even though many more buy them but never use them. It’s no surprise that Paul could find a Kroger store wherever he lived. Paris’ store is number 957 and one of over 2500 Kroger stores in 31 states. Begun in 1883 by Barney Kroger in downtown Cincinnati, his company has had to reinvent itself over the last 129 years. Mr. Kroger wouldn’t recognize the size of his stores today, their quality control, in-store pharmacies, electronic scanners, and consumer research. Sales at its flower departments make the company the world’s largest florist. And Mr. Kroger would be surprised his company owns one of the country’s largest privately owned truck fleets that moves between Kroger distribution centers and stores. Kroger has continued the founder’s in house manufacturing of store name products to better compete. Paul is in good company as a store clerk. The president of Kroger, W. Rodney McMullen, started as a part-time clerk in 1978 and has worked his way to the top position. Paul has no interest in promotions. What he does like is the company’s emphasis on customer service. He says, “Kroger believes in taking care of the customer.” One way is a number on your receipt that can be called to give an opinion on the service received. Most retired teachers are happy to enjoy all of their new found free time. Paul Helton is different. He needs more interaction with people in a supportive environment. He found that in Paris with an old friend - Kroger. I first noticed the hot air balloon option for tourists at Angkor Wat in Siem Reap, Cambodia. These extensive thousand year old ruins spread over 40 miles with the tallest peaking out over the surrounding jungle. It’s hard to grasp the extend of the temples without an aerial view. But what ascends must descend and landing in the dense vegetation could be painful. The solution was a tethered balloon that rises straight up and hovers while riders enjoy temples from above. It peaked my interest in a transportation form that has been around for over two hundred years. 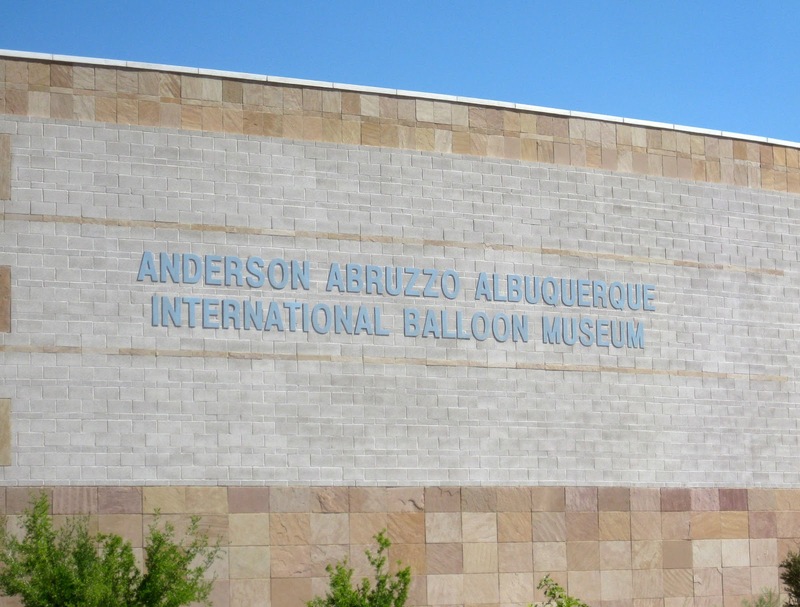 Thanks to the beautiful Hot Air Balloon Museum in Albuquerque, officially known as Anderson Abruzzo Albuquerque International Balloon Museum, I learned much more of the balloon’s history. A duck, sheep and rooster were the first passengers in an hot air balloon launch attended by over 100,000 people in France in 1783. The Montgolfier brothers thought it smoke that lifted the balloon and so used old leather shoes and rotten meat for the fire. In the same year, helium was first used to lift the gondola or basket. Those two sources of power (lifting) are still in use - the helium gas system for long distance trips and hot air for short rides. Hot air balloons rise and fall depending on how much hot air is heated into or released from the “envelope” as the balloon is called. There have been improvements over the years, the most important one coming in 1950 when Ed Yost invented the propane system. Ed Yost site This made the journey much safer and more reliable, thus opening up widespread use of the balloon for war time and strategic observation, photography, monitoring weather, and frivolity. Helium powered balloons manage their altitude with ballasts - heavy weights that are tossed when the balloon gets too low - and a valve to release gas if too high. The records set by helium balloons are really quite recent. First Crossing of the Atlantic - 1978. First crossing of the Pacific - 1981. First trip around the world without stopping - 1999. And first solo trip around by world in 2002 by Steve Fossett. As interest grew in the sport, festivals sprouted. Albuquerque’s International Balloon festival in September is one of the world’s largest with participant cut-off at 500 balloonists. 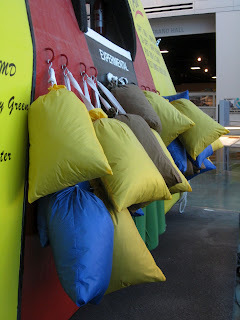 At the museum, I visited with Tom Fisher, who took up ballooning after retirement 15 years ago. 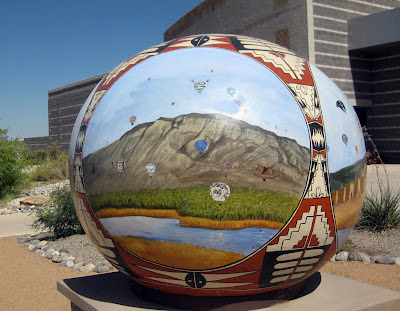 Fisher enjoys going up in Albuquerque because of the famous “Albuquerque Box.” With mountains on both sides of the city and a southerly air stream at sunrise, an inflated balloon can travel south, be pushed to the west, rise up to warmer air heading north, and drop back east to the beginning - a box like figure. International pilots love the box and thus the fame of the festival. Tom gave some basic information. “If you go up, you must come down”, thus the need to check weather first. Eight to ten miles per hours is the maximum wind to fly, with no wind the preference. “Light and variable winds” is a good forecast for launching. Since wind currents are invisible, a small balloon called a pibal can be sent out to determine where air is flowing. Balloons also fly like a porpoise to find wind direction. Wires are the major source of injury. In the United States, all pilots must be licensed by FAA and the balloon inspected every other year. And never say “blow up” a balloon. Inflate is the proper verb. 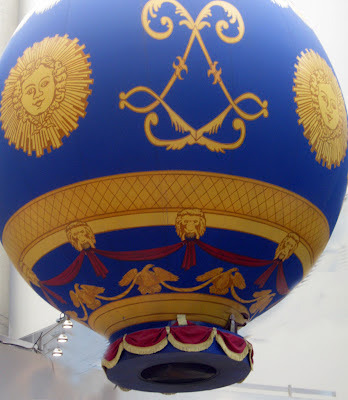 The museum offers a simulated ride in which you can guide the balloon by pulling one cord to go up and a second to descend. There’s no such thing as a left or right turn unless the air currents take you there. Even with Tom’s advice, I still missed my target as I gained appreciation for the challenges of directing a balloon. It’s easy to understand the widespread use of balloons in tourist areas, especially deserts where landings can be softer. Balloon rides are advertised in the Wadi Rum sands of Lawrence of Arabia fame and are a well used option at Cappadocia in central Turkey. Balloons hover over Sedona, Arizona in the early mornings. And they can take you over the Galilean hills of Israel, the southern Alps of New Zealand, and the red city of Jaipur in Rajasthan, India. But for the many who will not be witnessing ruins by air, the Albuquerque Balloon Museum gives an appreciation of the sport without a hard landing.